I recently looked at the cheapest options for mobile data for your iPad 3G. But if you’re thinking of buying an iPad, you may not want to splash out the extra £100 for a 3G model instead of a Wifi-only model. However, what if you do need mobile broadband? Maybe that £100 is worth it? So here’s a comparison between the prices of the different iPad models, with their differing mobile broadband options. 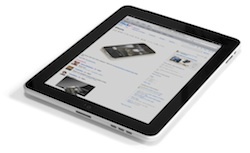 With an iPad 3G, you have built-in mobile connectivity, and a choice of tailored tariffs from the mobile networks. With the Wifi-only iPad, you have to roll your own. A good way of doing this is by using 3’s Mifi router, which uses the connectivity of their network, but gives you a wifi connection. The other difference is one I’ve mentioned already – the setup cost. The 3G iPad costs £100 more than the Wifi-only iPad. On some of 3’s mobile broadband tariffs the Mifi router will cost you to buy, on some it’s free. How do iPad mobile data options compare? In order to compare tariffs, I’ve stretched them over 18 months, which is the minimum of some of 3’s tariffs. I’ve also removed the sub-1Gb, sub-30 day data tariffs, as they’re not good comparators over this length of time. In the table, “Setup Cost” means either the cost of the Mifi router (if it’s a wifi-only iPad), or the extra money you’ll pay for the 3G model. Wifi-only 3 3Gb MiFi 10 69.99 30 days PAYG 249.99 Call Three to activate MiFi pre-loaded with 3Gb data. Assumed lowest additional top-up. 3G Orange 3Gb Micro-SIM 15 100 30 days Rolling 30 day 370.00 Call Orange to activate Includes unlimited wifi with BT Openzone in UK & Eire. Out-of-bundle 3G data charged at 5p per mb, capped at £40/month. £10 initial credit. 3G Vodafone 5Gb Micro-SIM 25 100 30 days Rolling 30 day 550.00 Activate on iPad 3G Originally promoted as "unlimited", now changed to £5Gb. 3G Orange 10Gb Micro-SIM 25 100 30 days 1 month 550.00 Call Orange to activate Includes unlimited wifi with BT Openzone in UK & Eire. Out-of-bundle 3G data charged at 5p per mb, capped at £40/month. £10 initial credit. For example, on an 18-month contract, 3 is £109 cheaper than any other network. Even if you go for the same 30 day option (PAYG on 3, rolling contract with the others), it’s £50 cheaper over the same period. At the other end of the scale, 3 will give you 15Gb per month compared to Vodafone’s 5Gb, and it’ll cost you £100 less over an 18 month period. If you choose 3’s PAYG option instead of a contract, it’ll still cost £50 less than Vodafone for triple the bandwidth. Apart from cost, there’s one little extra if you choose a MiFi: the iPad thinks you’re using a wifi network, not a cellular network. So, you won’t be faced with restrictions Apple has put in place when you’re using 3G, such as being limited to downloads of less than 20Mb from iTunes. James Burland has written about his experience with a MiFi and iPad over at iPad Creative. Well if you’re going to roll your own mobile broadband, why not go the whole hog? Buy an unlocked Mifi from eBay for about £90, and while you’re at it, buy a data SIM from any network you like off eBay as well. As we’ve been looking at 3, here’s one for sale that’s £34.99 for 12Gb data, and it lasts for a year! That’s £90 plus £35 = £125 for 12 months. Even if you add on another 12Gb data SIM, then the total cost is still less than the cheapest official 3 Mifi router, you get more data, and you get to use it over the year as you see fit. Nice. One last option: forget the MiFi, just buy the normal data SIM off eBay, then apply a meat cleaver to make your own micro-SIM. Proceed at your own risk! That’s a pretty good idea – I hadn’t heard of those routers. That’ll allow you to choose between any dongle data plan. Thanks Andrew! yeah, seems a great idea, but I hadn’t heard of those routers too. this article “Tips to Turn iPad Wi-Fi Into 3G” in ifunia ipad column might also interest readers.